We begin on Aug 13th. Older kids work independently in the mornings. I totally love that they just do their work. That is the beauty of the Robinson curriculum*. No fancy work, no expensive extras, just simply to read, write, and do math effectively. So on my Rhythm chart above, we ideally begin around 9:00. 9:ish works for us. Sometimes sooner, sometimes later. I am not a drill Sargent. I spend the morning with my littles. Biblical character lessons, scripture memory work, emotions, weather & calendar work. discussions, copy work, craft, & activity time. the younger kids enjoy story time and Math lessons. I have lunch w/ my kids. I’ve teamed up my kids on a buddy system. An older one w/ a younger one. During lunch we will listen and practice our foreign language. and slowly add our American Sign Language to what we are learning! Foreign language is meant to be practiced actively. Lunch time is a perfect setting for us. The younger kids will have quiet time in the afternoon. They may play quietly in their room, or watch a educational movie of my choice. followed by a read aloud time of a biography of a historical figure. (Benjamin Franklin is up first on the list). We will also do a quick spelling/grammar review before moving onto Chemistry lessons. The “big kids” are TJ (junior), Shane (neighbor boy/ freshman), & Katie (6th grade). School should wrap up around 2, followed by jurisdictions. I have to admit that this year will be our easiest year by far since beginning homeschooling in 2001! This is the first time there will be no baby/toddler distractions. 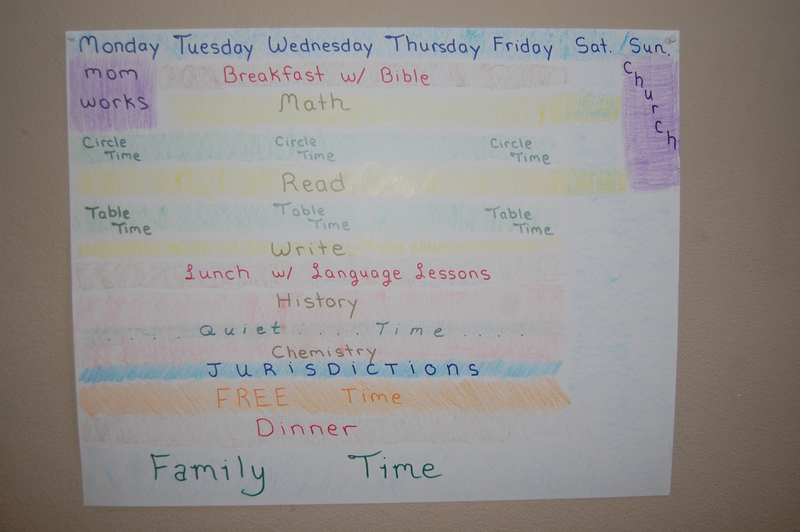 Our days are outlined quite smoothly, because, well, the littles are actually old enough to follow directions (and really shouldn’t be called “littles” anymore, but I haven’t quite figured out another phrase to distinguish them from the older kids, lol). Looks like you have it all together. Way to go, mom!